Call 888-883-0107 or email us. Orbus's Round Fitted table throws with custom dye-sublimation graphics provide excellent color matching for most logos/artwork, great for small booths or tight retail spaces. 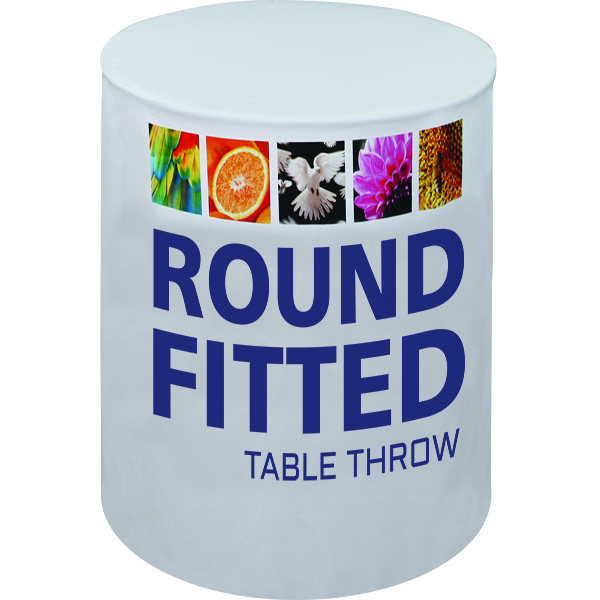 This fitted throw comes in 4 Round table sizes (30" height). We have also added a NEW Cocktail Table Size, which is a 42" tall table covering. These are full throws that cover to the floor. Includes a back zipper for convenience and access to storage underneath the table. Optional carry bags are available for easy transport. Made & Printed in North American and features a 6 month manufacturer warranty. *For Critical PMS Color Matching, Please call us for a custom silk-screen printing quote. Printed Table Runners can add contrast and visual excitement to a plain table throw! Perfect for a variety of uses when you are not sure your table size will always be consistent. 3-Sided Table Cover - Table covers and Throws are made of flame retardant and wrinkle resistant 100% Polyester fabric. They are open in the back and come in 6' and 8' Long sizes. This 3-sided custom table skirt with printed graphics is open in the back and is perfect for basic logos and text! This 3 sided custom table skirt with Full color printed graphics is open at the back and is perfect for complicated logos, text, and photographic imagery. Please fill out the required fields. EMAIL UPDATES To sign up to receive exclusive offers, new product information, or if you just like hearing from us, please enter in your email address and click sign up. Copyright 2019 © New World Case, Inc. All Rights Reserved. Fill out this form completely for the best service.